Early Childhood Education provides valuable insight into the physical, intellectual, social and emotional development of children. 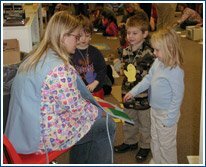 Students explore current issues as well as theories and techniques in the care and education of infants, toddlers, preschool and primary school children including the special-needs population. WCCC operates a state-licensed preschool, which offers each student the benefit of observations, enrichment opportunities and professional growth. Each student will have the opportunity to obtain First-Aid/CPR, Communicable Disease and Child Abuse certification. Early Childhood Education has an articulation agreement with Sinclair Community College that will allow students to earn up to six credit hours upon successful completion of the two-year program. Students who earn an Associate’s degree at Sinclair have an opportunity to complete a Bachelor of Science in Education degree at University of Dayton with a half-tuition scholarship, provided the student meet qualifications determined by UD. Students have the opportunity to work in the on-site, licensed preschool at WCCC and observe at other area childcare centers and elementary schools to gain skills in working with young children. Seniors have the opportunity to participate in early job placement the second half of the school year. Criteria for placement include instructor recommendation, grade point average and attendance. Students in Early Childhood Education participate in Family, Career and Community Leaders of America (FCCLA), an organization that provides personal growth, leadership development and career preparation opportunities for students. All students also have the opportunity to participate in the Tech Prep Showcase through the Miami Valley Tech Prep Consortium. Contact Instructor Lisa Powell at 513-932-5677 ext. 5364 or lisa.powell@mywccc.org.